Alamo Trust, Inc. (ATI) meets on the call of the Chair. The location of its meetings are generally at the Alamo, 300 Alamo St., San Antonio, Texas. Although not legally subject to the Texas Open Meetings Act, due to the great public interest of the public in Alamo operations, ATI meetings are open to the public. ATI may meet in closed executive session for consultation concerning attorney-client matters, real estate, economic development, litigation, contracts, personnel or security matters. On occasion, the ATI may be called in to a special meeting by the Board Chair upon written request of the CEO, any Board member or the Chairman of the Alamo Endowment. ATI may also meet at locations other than the Alamo for specific public hearings or informal work sessions. Notice and agenda for all regular and special meetings will be posted online at least 72 hours prior to the meeting. To ensure that a quorum is present, each Alamo Trust, Inc. meeting begins with roll call by the Secretary or his/her designee. The Chair then calls the meeting to order. Following, the pledge of allegiance to flag of the republic of the United States of America, to the Texas state flag, and approval of past meeting minutes, ATI members may recognize audience members and make announcements of general interest. Alamo Trust, Inc. begins the official business of the meeting agenda by considering individual agenda items, followed by consent agenda Items. Items for individual consideration are designated for the beginning of the agenda and often merit a detailed staff presentation. Consent items include routine items such as the purchase of equipment and supplies, capital improvements, or other similar items. ATI Board members may "pull" consent items for individual discussion, staff presentation and an individual vote. During the meeting, time-certain items, including public hearings may be conducted and considered at their posted times or as soon as possible thereafter. At any time during the meeting, the Alamo Trust, Inc. may recess into executive session. The ATI Board may also recess for breaks and continue consideration of outstanding items on the agenda. The public may address the ATI Board at its meetings by registering in person. Members of the public must sign the designated sign-in sheet prior to the posted time of the meeting or the posted time of an individual item for consideration, whichever is later. Members of the public will be given three minutes to speak, subject to discretion of the Chair. In lieu of verbal testimony, written testimony in support of or in opposition to an agenda item may be submitted to the Secretary. Testimony forms are available online. Agendas for regular or special Alamo Trust, Inc. generally will be posted at least 72 continuous hours prior to the beginning of that particular meeting. Said notice and agenda will be posted online (see past meetings below). There will be a series of public meetings to discuss the Alamo Plan. All meetings are open to the public with opportunity for public comment. Alamo Citizen Advisory Committee Meeting 8/30/2018: This Alamo Citizen Advisory Committee (ACAC) meeting was held in the City Council Chambers on Thursday, August 30. The committee voted in favor of advancing the preservation and restoration plan for the Alamo complex. Alamo Citizen Advisory Committee Meeting 8/27/2018: This Alamo Citizen Advisory Committee (ACAC) meeting was held at The Menger Hotel on Monday, August 27. You can view the presentation shown at this meeting here. Public Input Meeting 7/18/2018: A fifth Public Input Meeting was held at Thomas Jefferson High School in July. This meeting included a summary of the Alamo Audience Research Study. You can read this study in full here. Alamo Citizen Advisory Committee 7/11/2018: This Alamo Citizen Advisory Committee (ACAC) meeting was held at The Witte Museum on Tuesday, July 11. You can read the agenda for this meeting. At the July 11 meeting, the Committee was presented with The Alamo Brand Perception Research study by H2R Market Research. You can read the questions used to create this study in the Alamo Brand Perception Questionnaire. 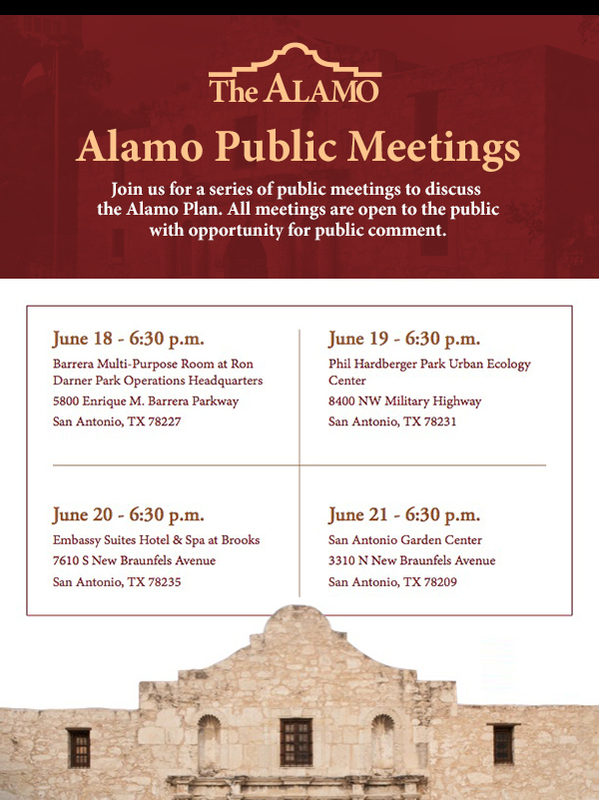 Public input meetings concerning the latest Alamo plan proposal were held June 18-21 at locations throughout San Antonio. Answers to questions submitted by the public during the June 18-21 meetings can be read here: Public meeting Q&A. A summary of public comments from these meetings can be found in the Alamo Public Meeting Comment Summary. Additionally, the Alamo Master Plan Traffic Study is now available. Alamo Citizen Advisory Committee 6/7/2018: This Alamo Citizen Advisory Committee (ACAC) meeting was held in the Prassel Auditorium at The Witte Museum on Thursday, June 7. You can view this meeting's agenda at this link. Alamo Trust, Inc. Board Meeting 5/16/2018: The most recent Board Meeting took place on Wednesday, May 16. Click here to view the full board report, agenda and minutes for this meeting.